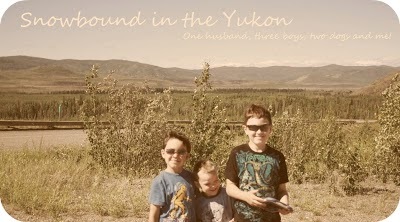 Snowbound in the Yukon: Later on. I wrote this awhile ago: I'll continue on at the end. I've been meaning to write this week but things got away from me. To be honest I don't even know what to write, i guess I'm feeling a little blocked. Or maybe I just need to stretch it out. Babble and maybe something will come out, if I can even babble I don't know. Our weather has been pretty mild lately with a lot of snow so my Husband has been keeping pretty busy. So busy infact that he hasn't put up my new pot holder for the ceiling. So the pot can be hung instead of in the lazy-susan that I hate. My kitchen is too small, still! I'm going to have the most perfect kitchen one day that my husband will build. I have so many ideas and I can't wait. One day! It's just a matter of waiting. The boys are good, I'll have to post some pictures soon. I haven't really been taknig much but I will try. The boys are into board games right now and there are a few I'd like to get for Christmas for the family. I wish I knew more people who liked games, I really want to have a regular games night. Or someone who liked card games or Scrabble. I want to get a Scrabble game too! Tonight: I meant to get on early but the day just didn't go the way that I thought it would. I wanted to have my house clean and up to what I would like to see it at. But, but. and more buts. Bubba has been sick since yesterday. He woke up and he was coughing a really terrible sounding cough, it sounds wet and dry at the same time. He's had a fever since yesterday and it was 103 for most of the night yesterday. Tonight he finally started feeling good for a little while and followed his brothers around but after an hour he was back to being clingy and wanting to lie on me. I feel so bad from him, he's just so pathetic, my poor little guy. I managed to get him into his bed for the second time already this evening. I'm sure once i'm in bed it won't be long before he joins me. He slept most of last night with me. Today I cleaned Buddy's bedroom and made more of a dent in the playroom. SmartGuy cleaned his own room and I did sweep up after and for the hall as well. I didn't get as much done today as I had hoped because I was holding my baby most of the day but whenever I had a chance I got something done, so that I am proud of. I was emotional tonight and being who I am and expecting my husband to read my mind and being too stubborn to get him to do something, I moped about it instead. So I made myself cry too much and felt terrible and neglected but it was my own feelings. You know when you plan or hope something will go one way. I asked Hubby to turn the tv off, thinking it would spur him to help me start supper or clean the kitchen. Instead he goes and lays down and then piddles on the computer or something. So I kept thinking how alone I was and I was everyone's maid!!! That is what I felt like today because I was constantly trying to get the house clean and no one was helping me or giving a damn! So I cried instead of asking for help. That's just me, pathetic sometimes. On the other hand I feel I did pretty good with my eating. Thought I do feel I might have ate too much. Breakfast was cereal and milk. Later hubby made boiled eggs so I had two with one slice of toast. Later, I had an apple and a bowl of chicken noodle soup. I had 5 digestive cookies today. I had a snack at some point of cheese and cantaloup. I tried a Coke Zero for the first time and it was gross but I drank it anyway. For dinner was shake'n'bake porkchops with rice and raw carrots and snap peas. I had a little bit of salad dressing for dip and some apple sauce on my deck of cards shaped meat. I drank a lot of water. I realized a lot about myself and how I make things happen that affect my own feelings. My own drama that I cause in my life. I was doing so good up until then with cleaning and getting things down the last couple of days. Damn I can hear Buddy coughing now, I hope, hope, hope he doesn't get the cold. I'm so tired from my kids right now. I will say though that we had some great times this weekend, one on one, reading time, they did crafts and they did help a little with the cleaning. Even Bubba who helped with some dishes yesterday. I'm off to bed right now.